He conversion ratio or a web site conversion rate is the percentage we get by dividing the number of goals met by the total number of visits to a website. So, this is the metric that measures the success of a website. English call conversion rate. For example, if this month you've got 20 sales through your website and you had 600 visitors. Your conversion rate is 3.3% (a good conversion rate for e-commerce). Or for example, if this month you got your users fill 100 forms asking for more information about your products and you had 1,500 hits, you have achieved a conversion ratio of 8.3% (not bad for a contact form, although it could be better). For each type of website is a definition of conversion: get a download, a sale, a request for quote, book, newsletter registration, etc. Why is it important to know the conversion rate of your website? 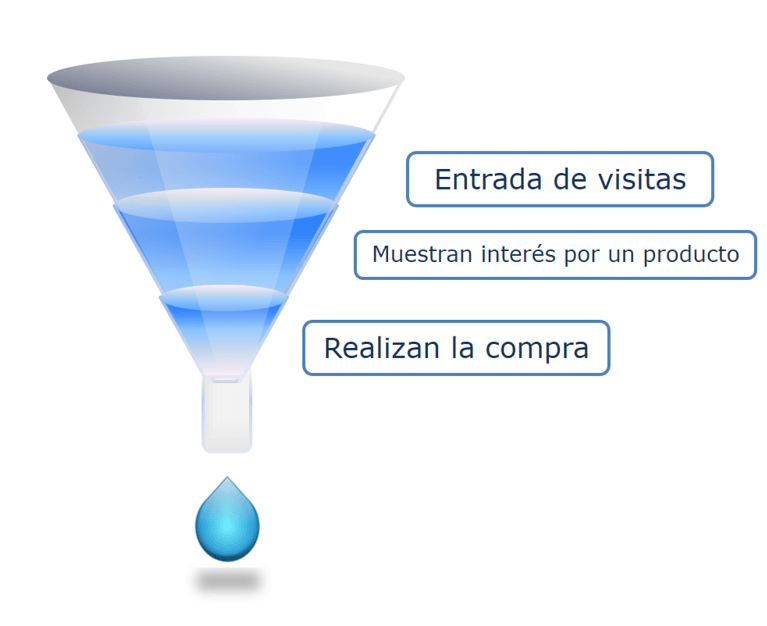 If all you are measuring how many visitors you have and do not create a funnel for various purposes, you can not improve the performance of your website. You'll spend only bring traffic to the site without realizing that instead of a funnel have a strainer that loses users everywhere ... and this is very expensive. In the long run you have serious financial problems. Achieving an increase in the average ticket, ie getting your customers to buy more in each transaction. Increasing margins with which you work, ie, increasing prices (if your customers put up) or performing best buys (if your suppliers consenting). The easiest is the second. If you improve the conversion rate with the same traffic, the same price and the same purchase price, you'll get better results. How to calculate the conversion rate of your website? The first thing you should decide is what to target or targets have your website. With this information creates a Funnel as you see along these lines and set up conversion goals in Google Analytics. Once configured you can start measuring the behavior of your users. The next step is to start working the increase in conversion rate. What conversion rate should have your website? For e-commerce: Between 1% and 3%. May reach 5% to 9% if the product is very good and you're a super specialist in digital marketing. Also keep in mind the industry for which you work. For a web contact form: Between 10% and 15%. When you do not ask money if you do not fill out a contact form is easier to obtain a good conversion, so it is normal to get up to 15% if the digital marketing is well done and really attract to your website only your target audience. When you start, you do not normally get 0.5% but as you know your users and understanding how your business works online you improve this rate to achieve the expected results. To help a little in determining what would be your correct ratio included this table that WordStream indicates ratios CTR by industry, ads in Adwords updated data 2018. Ojo, are not the conversion rates of the site are only ads ... but they can give you an idea of ​​the variations by type of industry. If you want to read the whole article, you got here: conversion ratios by industry. How to improve the conversion rate of a website? Download speed: If your website is slow people do not want to navigate it and go before've become. In addition Google will penalize you for being slower than normal and above will not have traffic ... so the download speed is important. Measure it on the Google tool: Google Speed ​​Test. Follow the personalized tips that will tell Google. Usability: Make sure your users understand well what to do on your website and do not get lost along the way. Also check out what it's like sailing through a mobile. Google performs the test: Mobile optimization test and follow Google's advice if your page is not optimized. Persuasion: verifies that your website indicate what to do and persuasive in your messages explaining what to solve the problem and how you will serve your product to the user. Segmented do so. That is, for each segment, a specific page, speaking from the point of view of the customer and vocabulary. Shows photos of your segment using your product to be reflected in them. Transmission of trust: make sure your site is professional, with a design that reflects your brand values ​​and is user friendly. Encrypts the entire website to the user's browser indicates it is safe (used in https instead of http) And the user feels safe. If you are a member of an association or chamber of commerce, indicate also gives users peace of mind knowing that if they have a problem you can appeal to a higher entity. In the "about us" shows photos of yourself or your team generally stick up for your business conveys confidence. Attracting well done: Obviously, if people entering your website is not your target audience can not convert them. Make sure the SEO and other techniques to attract visitors are well done. With these 5 tips you should start increasing your conversion rate and therefore your billing. The past 19 and 20 May, under the Practitioner Web Analytics 2009 and in one of his presentations, Avinash Kaushik We talked about the importance of A/B Testing when increasing the performance of a website. He A/B Testing It is to test different versions of a web page or an area of ​​the website, and decide which of these versions is the one that gets better results. Although this service is offered from GeaIPC, Few companies decide to use it even when the results are truly spectacular. Indeed, my presentation at the PWA09 It was to explain a case in which the booking engine one of the hotels AC Hotels spent to double the number of bookings due to changes implemented in said engine, testing it with techniques A / B Testing. The steps of the home to inland areas that interest us. That is, is supposed to have determined conceptualize our navigation different routes ... so we must test if the page is designed so that these routes are followed by our visits. Las “pain pages” (Avinash and called them and I think it aptly named). Are pages that have a lot of traffic, but also a high bounce rate (people coming directly to them and leave the site without having sailed). Must review and test different versions of the same to get lower bounce rate. Try if it improves performance or scroll page without scrolling. This point is interesting. In the study Usability Eyetracking we published in January and indicated that very few of those under 25 we tested, did scroll in the Google results pages (which were those testeábamos in that study). If our website has a user such as target audience, this is a good thing to test. "Dramatically different" designs (English is better than in Castilian, but good). Avinash what I meant is that we must try to completely different designs we are using. We may find one that also has "dramatically positive" results. The good thing about A / B Testing is that it is easy to make and if we use Google Website Optimizer, may not even cost us money. Google offers free Website Optimizer that allows the real-time test as many versions as you want, and then indicates which of the tested versions have better results. The image we can see along these lines shows the control panel of Google Website Optimizer. Certain words stand out. "Luxury" is one of them. Following analysis Eyetracking tests for the study of Search Marketing-oriented tourism, conducted during the months of December and January, today we will talk about the words that attract attention in the texts. In the study "Eyetracking Media España"By the AIMC Y Alt64 in which I participated in 2005 when we analyzed the patterns of reading Spanish online press, we noted that before starting the reading of a text, the brain of the user scans the page you're thinking of reading, searching for words to call him attention. When the brain encounters words then you decide whether it is worth making the effort to read or not. As I was operator of some of the tests conducted in December 2008 during the recording itself and I noticed that many of the people tested specifically looked some ads. Eye! No clicaban, only looked ... I mean, something caught their attention, but then kept looking. Obviously, some do clicaron on them because most of ads had to do with the search performed by the user. If we look at the attached recording (see attached video), observaremos que tras revisar la página de resultado, algo llama la atención al usuario mientras mira columna de Adwords de la derecha. Hay un anuncio que llega a mirar hasta 3 veces. 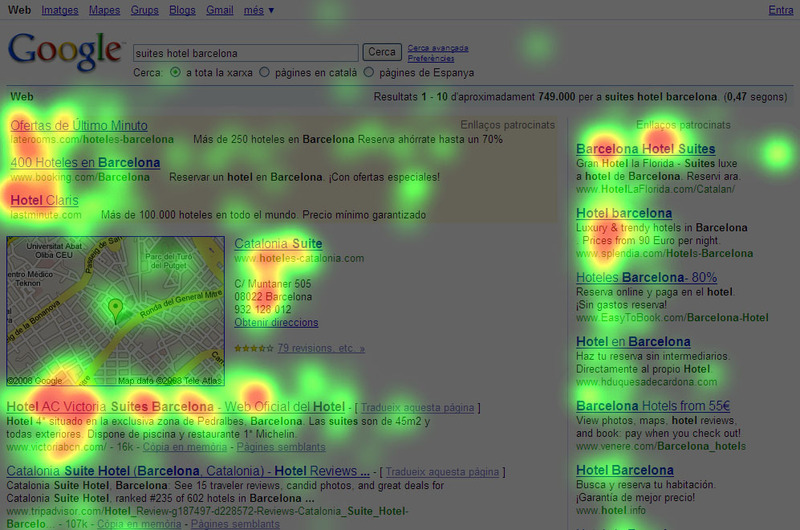 La grabación pertenece a un usuario al que se estaba testeando en la búsqueda “hotel Barcelona” y su tarea consistía en indicarnos dónde buscaría un hotel en esta página de resultados (SERP=Search Engine Result Page). We can see that after reading more or less in depth the SERP, goes to read the ads on the right and after them all, staring at one of them and then return to it. It is the announcement of Splendia. Why is fixed at that ad? You failed to tell us why. Another user (see this other video attached) In the same SERP it performs the same type of navigation and again is fixed in the notice ... but this time also it click. Why do you look at him? Why do you click? Asked the user, he says that just because they noticed him, liked what it said (and that is) and CLICO in it. But the action set in this particular ad and not the rest has been something that has made 22% of users (12 persons over 54) who tested this page. Looking at the map of heat generated by these users, we found that really something caught 12 people. 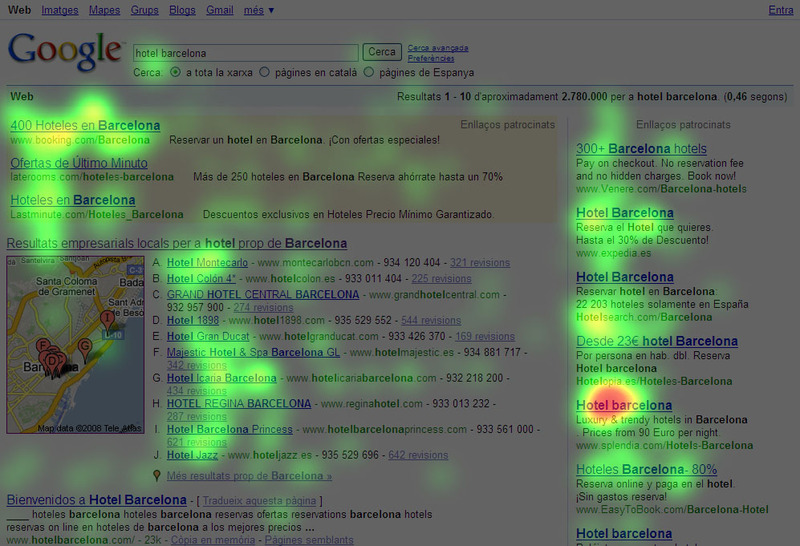 In another task in which users tested were looking for a hotel suite in Barcelona from the SERP that appears when searching for "suites hotel Barcelona"He happened exactly the same, but with greater intensity: this time, 37% of users set their sights on a particular ad: Adword second in the right column. And guess what ... it was again Splendia announcement, which appeared on this page in another position. Again, something caught the attention of users, this time 20 people from a total of 54. This "something" that draws attention to many users in different search results pages, is the word “Luxury” that Splendia used at the beginning of the description of your ad. 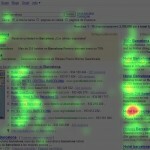 In the study Eyetracking Search Media You can read more about this and you will discover what else caught the attention of users. https://www.montsepenarroya.com/wp-content/uploads/2017/09/MP-Logo-Web-1.png 0 0 Peñarroya Montserrat https://www.montsepenarroya.com/wp-content/uploads/2017/09/MP-Logo-Web-1.png Peñarroya Montserrat2009-01-22 21:47:182010-05-18 16:54:06Certain words stand out. "Luxury" is one of them. Open Conference cycle: "The 16 things you need to know to sell online"
Today I had the pleasure of teaching this class of Digital Marketing at University Graduate Institute, an institution that teaches master's degrees online for professionals, and was created by Santillana Training together with the Universities of Alicante, Carlos III of Madrid and the Autonomous from Barcelona. Todo se ha desarrollado según lo previsto, exceptuando la duración de la clase, que ha sido un poco más larga de lo que teníamos en mente… y es que me cuesta mucho sintetizar tanta información en tan poco rato. Sobre todo cuando tocamos temas que me apasionan como el SEO, la optimización de campañas SEM y la Usabilidad. No hay manera en que pueda ser más concisa y no ir tanto al detalle… aun así, siempre me quedo con la sensación de que podría haber explicado más cosas. Pero el tiempo es el tiempo… la clase de Marketing Digital completa es, como mínimo, de 20 horas… no hay manera de poder sintetizar esto en una hora, ni leyendo únicamente el índice del temario. De ahí que la clase de hoy se haya limitado a las 9 técnicas básicas para atraer tráfico a una página web, y hemos tocado un poco por encima las 6 técnicas básicas para convertir las visitas en contactos comerciales. I hope the students have learned apart from the existence of these techniques, have been wanting to expand the information and now are looking for additional information. Here is the presentation used in class: Digital Marketing - Basic Techniques. Then you have the link recording I hang here too. https://www.montsepenarroya.com/wp-content/uploads/2017/09/MP-Logo-Web-1.png 0 0 Peñarroya Montserrat https://www.montsepenarroya.com/wp-content/uploads/2017/09/MP-Logo-Web-1.png Peñarroya Montserrat2008-12-12 01:27:252010-05-18 17:15:00Ciclo de Conferencias Abiertas: "Las 16 cosas que hay que saber para vender online"
I find it particularly interesting to hear the different proposals on the Web2.0 applications to the hospitality industry that will make Google, Atrápalo and ITH, as it is not easy to apply a large number of concepts 2.0 to the website of a hotel, and so new approaches are always welcome. También la ponencia de Toni Mascaró promete ser interesante por la gran experiencia que tanto él, como su empresa, tienen en el sector hotelero online. Será un placer escucharlo. Witbookings GeaMarketing Y Witbookings estamos llevando a cabo una batería de A/B testing con la página web de un hotel, donde parte de los temas que testeamos son el impacto de los sellos de calidad y seguridad. El objetivo es aumentar la conversión de visitas a cliente en la web de este hotel del 1% al 3%. La página es nueva y está online desde agosto, ahora ya tenemos suficiente masa crítica como para empezar a realizar este tipo de tests, así que en ello estamos. The A / B testing is interesting: in some cases have reached 4.5% thanks to having made A / B testing with various versions of web pages of hotels ... but I'm going with "branches" and now I would speak of a / B testing and is an issue that goes a long way ... so I return to the issue of HotelTrack'08 and close the post: HotelTrack see you in next Tuesday! The Eyetracking Media Spain Alt64 study in collaboration with the IACM concludes that 61% of Internet users look online advertising. Alt64 Digital, the company that distributes in Spain the Eye Tracking technology, in collaboration with the Association for Research of Media (AICM), made for the first time in Spain a study looking at the eyes of Internet users as they read media online communication, the study called Eyetracking Media Spain. Es la primera vez que se realiza en este país un estudio de esta envergadura utilizando la tecnología Eye Tracking (seguimiento de la mirada) entre las webs y medios de comunicación online de mayor audiencia. Existe un antecedente en Estados Unidos que ha marcado el antes y después en el diseño de las páginas web y, en concreto, de los medios de comunicación online americanos, el Eyetrack Study, que llegó en 2004 a su tercera edición. To make the Eyetracking Media Spain, analyzed the 6 media online wider audience, whose content is in sight and where no registration is required to read: ABC, newspaper, El Mundo, La Vanguardia, La Verdad and reason. El análisis del patrón de navegación de los usuarios testeados muestra que las mujeres y los hombres leen la prensa online de forma diferente. Mientras los hombres leen en zigzag y se saltan muchos párrafos, las mujeres lo hacen de arriba abajo y leen, en la mayoría de los casos, los títulos y las entradillas de las noticias de forma completa. Tanto hombres como mujeres escanean las páginas en busca de palabras o de frases clave y en función de ellas, deciden si leer o no los artículos. The results show, among other things, that 61% of users watch tested containing advertising websites. And after a later interview to navigation, the study indicates that 52.9% of them retains the mark of the announcement. 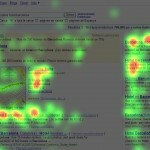 The study also shows that not include much advertising on a page, users see it more. Instead, with little publicity, but it made in certain advertising formats such as skyscrapers outer side or the top banner, is able to capture the user's gaze and get to see the ad. Además de estudiar los patrones de navegación, en el estudio se responden preguntas como: ¿Los anuncios se miran realmente? ¿Dónde se ven mejor los anuncios en la web? ¿Qué formatos de anuncio son los más efectivos? ¿Cuáles fueron los anuncios más mirados por los usuarios que participaron en el estudio? ¿Se puede medir la efectividad de la publicidad online? ¿Qué marcas fueron recordadas? The look of a human being is a good indicator of what is calling attention, and Eyetrack equipment automatically and with high precision is possible (less than 0.5% error) know, for example, what it is the journey of the gaze, how long the user stops at a particular point or area or whether the user is reading or scanning a text. Data are captured by a small camera that incorporates the monitor from the user navigates. The route of the gaze is videotaped and software so that the sample can be analyzed routes, times fixating, reading patterns, etc. A level of analysis of the sample, it is possible to obtain aggregated with dark areas information (areas that have not looked at anyone) and hotspots (areas that have looked most users) and make them heat maps pages website or any other medium being studied.